This marks the official 100th post here at Memepunks! A few months ago this site was little more than one person's hesitant attempt to give blogging another try. And now the Memepunks adhocracy is charging headlong into the future. We've exceeded our expectations by leaps and bounds. That can happen when you set up shop on a little place called The Internet. Our post on the space elevator grabbed the attention of the amazing folks at Liftport. We started people talking all over the Internet with our coverage of America's war on science. And our post on the possibility of a Google AI spread like wildfire, making the top spot on Reddit. It was linked to by author, and Boing Boing band manager Jon Battelle's Search Blog. Former Harvard Business Review executive editor and Rough Type creator Nicholas Carr even jumped into the fray. Tens of thousands of you stopped by to see what all the fuss was about. Many of you have stayed around for the duration. "Memepunks", a non existent word 4 months ago, now gets 30,500 hits on Google. To our fans, commenters, and anyone that has taken the time to read one of our posts. Thank you, thank you all, from the bottom of our hearts. Memepunks isn't just us, it's you too. We would also like to thank all of those who contributed above and beyond the call of duty. Most especially B, who has warmed into being a full time contributor, editor, webmaster and member of the ad-hoc. Couldn't have done it without you bro... not by half. We would also like to thank (in no particular order) MJL, Don, Gynkoba, Micker, Minister, Cory, TheMadElf, Shadowhawck, Marty and the BBC, Scathatch and the crew at AVcorp, Smokey and the CSS master, KC and Natalie, Jonathan, Rook and family, Brent, Stella, Vince, and all the rest of our friends and families. If we forgot anyone, rather than apologize to you, just gmail us or comment. We'll try our hand at revisionist history and add you to the list. Now, what's in store for the future? The proposed redesign of the site is still going strong and is only about a month behind schedule. We have a couple of extraordinary media events coming up, which we will announce soon. We are welcoming a guest blogger, who will bring an eye for trends, an ear for music, and matching X chromosomes to the mix. Look for MJL's inaugural post shortly. 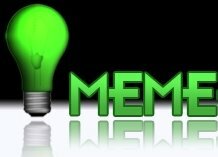 Memepunks will be attending the annual meetings of the Cryonics Institute and the Immortalist Society next month. And We'll be establishing a presence in Second Life, so we can start reporting on all the great things that go on there. Memepunks will also be revisiting some previous posts to see how some of these big future filled projects are progressing. Look for more reviews of books, movies and music on the horizon. And of course we'll be putting up a torrent of posts on biotech, robots, web 2.0, space travel, nanotech, computers, AI, the IP wars, the Google revolution, cutting edge science, paradigm shifts and Internet weirdness. All in all, not a bad first 100 for a couple of computer techs from the suburbs of Detroit. Thank you again for making the first 100 possible. And here is to 1000 more! Onward and Upward. All I can say is its been a pleasure. LONG LIVE THE WHUFFIE AND THE AD-HOC!!!!!! Congrats Memepunks cast and crew! This has been one of my favroite sites since I first learned of it's existance. I expect it will continue to be a phenominal piece of work into the future. Congratulations my friends, on a job well done! I look quite forward to being a part of the next hundred; and that new site is going to be faaaaaan-tastic!